Eagle Pools Services offer the best pool maintenance Boca Raton FL. Conditions of pools and spa’s water can constantly change. Evaporation, water loss, water replacement, rainfall or when you add chemicals all these factors affects pool’s chemistry. Manual water testing it is essential to ensure quality and the changes that must be made to the water. There are many ways to make the water chemical testing, but we recommend that you use a dip-and-read test strips. This method is a quick way to check if the chemicals levels (chlorine, ph, total alkalinity, calcium hardness and stabilizer) are within the ranges. Always store test kits protecting them from light, heat or chemical exposure been aware of the expiration date. Discard the test kit if you notice any change in the appearance. Follow the instructions to minimize mistakes. Even though you may need to call a pool technician to make chemical adjustments and provide the accuracy necessary. Also, keep in mind that error in testing can damage the pool operating system and compromise the pool water conditions. This is the more accurate and reliable test because its electronic reading beam. The color match is the base for all pool and spa water analyses. A standard reagent indicator and a solution called titrant are needed to complete the water balance. Those two chemicals will change color as the end point is reached. 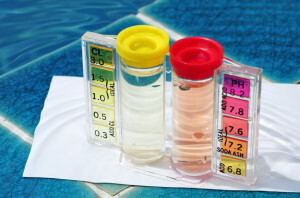 Use this test when your pool or spa water is cloudy with particles that are suspended in water. A calibrated cell measures the cloudiness or turbidity. It is an electronic test meter that you should only use if you can clearly see the main drain from the pool deck. This test can only be performed if the pool water is clear because it is based on the amount of light reflected in the water. Used to determine water turbidity and it is acceptable only if you can see the disk in the deepest part of your pool. Those types of tests requires frequent calibration and are available to see levels of pH, total dissolved solids, oxidation-reduction potential, nitrates, and others. To finish this subject, we should tell you that the chemistry of your pool water it is a science and it is extremely necessary to test frequently using an accurate method. If you wish to enjoy a clean and health swimming pool water, give Eagle Pools Services a call. Our phone number is 954-573-4916. We have the best technicians in town that can easily do the hard work for you.